adidas' marketing pitch: Energy-returning shoes built for speed. Upper: Engineered mesh, synthetic leather. Midsole: Boost foam with compression molded EVA foam. 10 mm heel offset. Outsole: Hard Continental rubber from heel to toe. 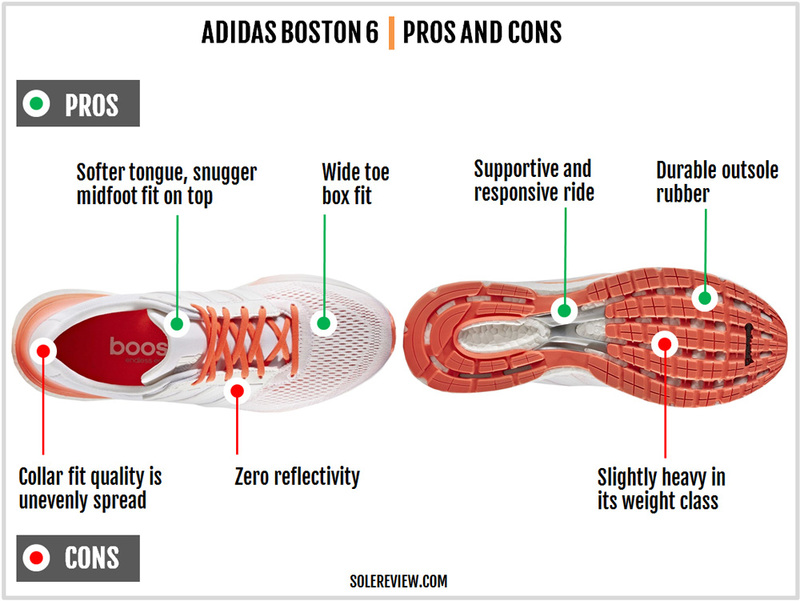 The Boston 5 Boost had a long and narrow fit; the Boston 6 does not. Removing the suede layers and introducing engineered mesh eases up the forefoot fit. The ride is similar except for the slightly softer feel under the forefoot. Many were waiting for the Boston Boost update in 2015, but that didn’t happen. 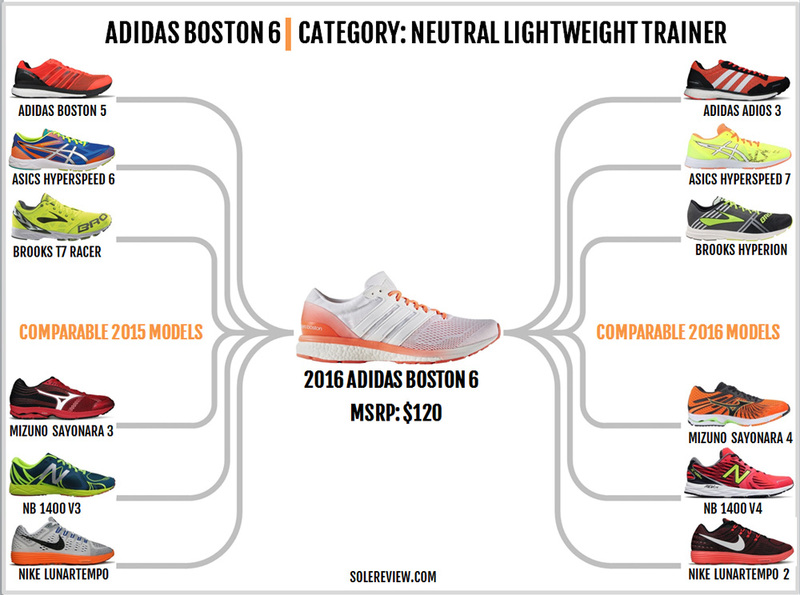 A shoe which claimed to be the Boston 6 Boost showed on up on the internet last year. In retrospect, the fact that the ‘new’ Boston 6 was a women’s only release made it seem rather unusual. As it turned out, the so-called Boston 6 was a TSF variant of the Women’s Boston 5 Boost. 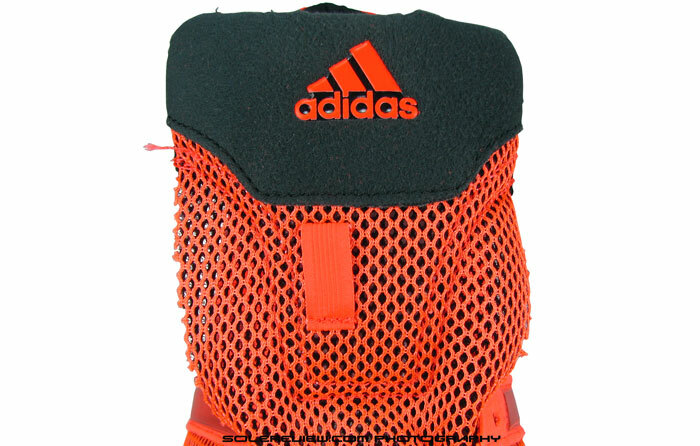 The forefoot had a Primeknit inspired upper instead of the regular mesh version. For a short while, this shoe became the unofficial Boston 6. To this day, the Boston TSF remains erroneously labeled as the Boston 6 by a few popular websites. The real Boston 6 Boost made landfall recently, the review of which you’re reading today. It gets a full upper makeover, and the outsole design receives a few updates. And no, it does not have a knit upper. For those new to the Boston, here’s a quick lowdown. The Boston Boost is one of adidas’s fast training shoes, positioned between the cushioned Glide Boost and the adios 3 racer. It does not have the racing flat quality of the adios, and at the same time, steers clear of the GB8’s relatively generous cushioning. 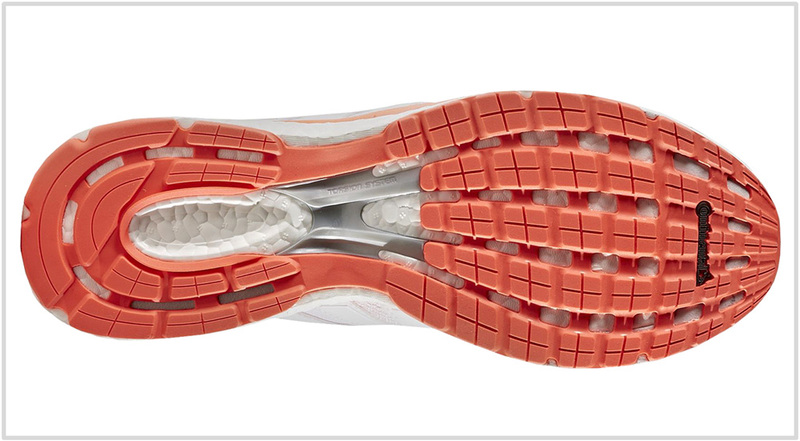 Another way to view the BB6 is to do so as the neutral version of the Tempo 8 Boost, its ‘stability’ equivalent. 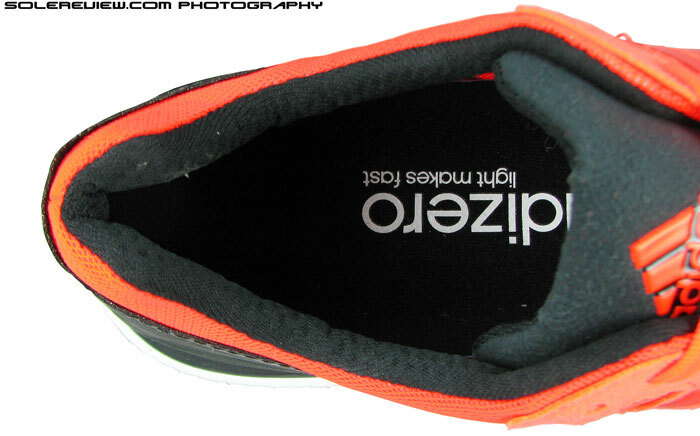 The upper fit quality is also between the Glide and the adios. 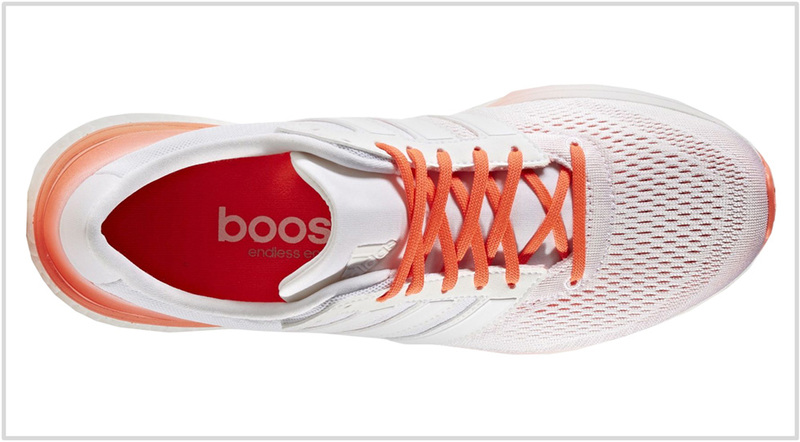 The Boston 6 Boost’s upper isn’t race-day snug like the adios. 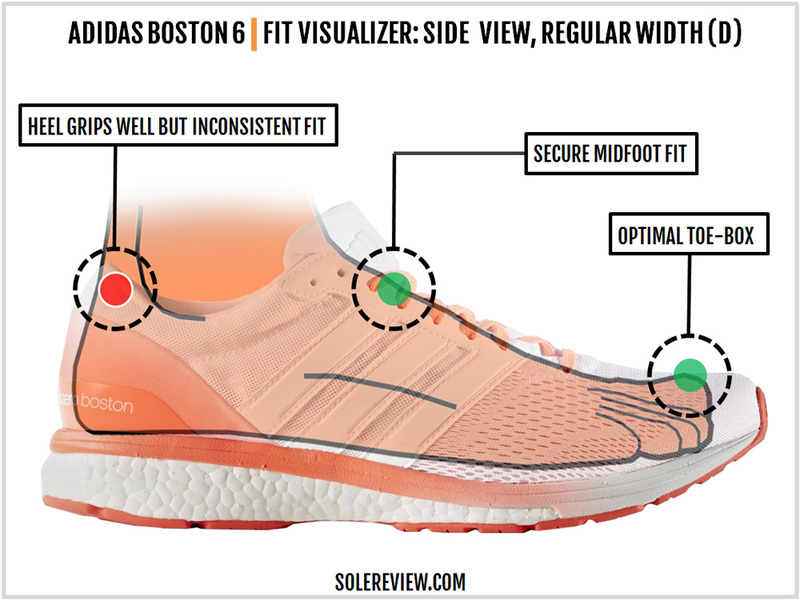 The Boston 6 Boost’s fit feels relatively relaxed, and yet it isn’t as wide as the Glide Boost. If you’re wondering what the word Boston in the shoe’s name stands for, it’s the city which hosts the legendary namesake marathon. 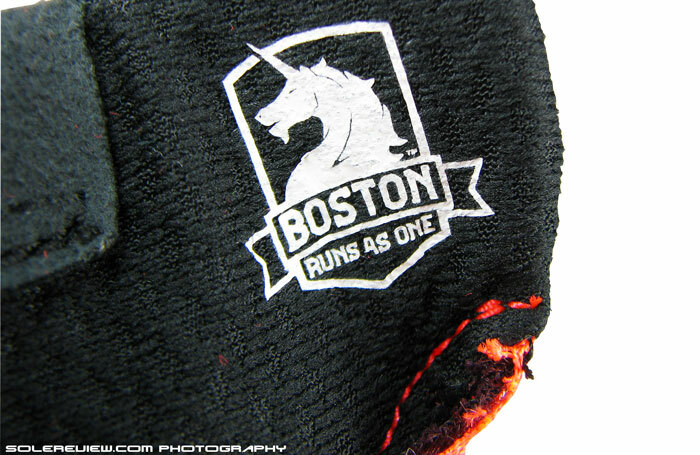 Last year’s Boston 5 even had the official logo printed under its tongue. There are plenty of footwear models which work great for fast training runs to a marathon. New Balance sells its 1400 V4; Asics markets the Hyperspeed 7, and Nike has the Lunartempo 2. Brooks’ equivalent is the Hyperion, and standing in for Mizuno is the firm riding Wave Sayonara 4. From an upper fit perspective, the Boston 6 is more relaxed than most on the list. It easily has the tallest toe-box, only rivaled by the New Balance 1400 V4. The forefoot isn’t also super tight like many, achieving a good balance between snugness and sloppy fit. 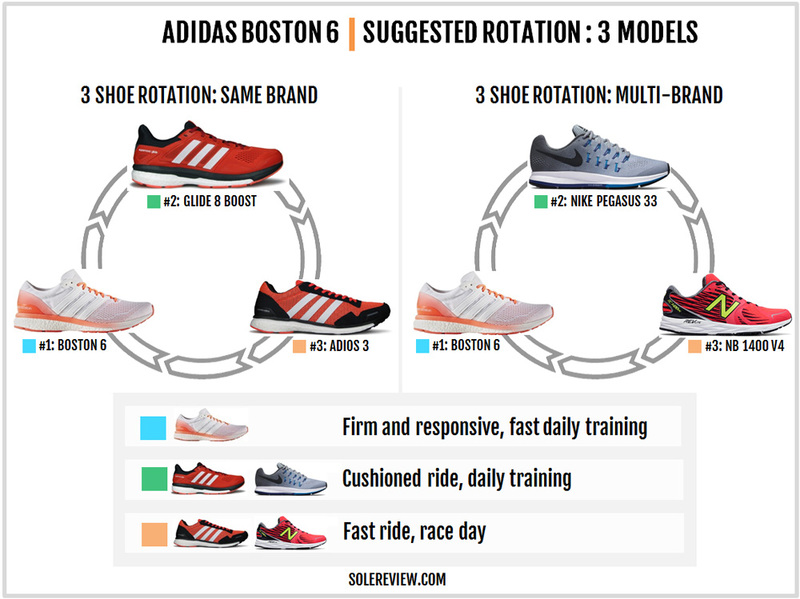 The differentiating factor is the Boston’s responsive ride, which is true for most adidas models these days. The Boost midsole of the Boston rewards increased running pace with responsiveness. 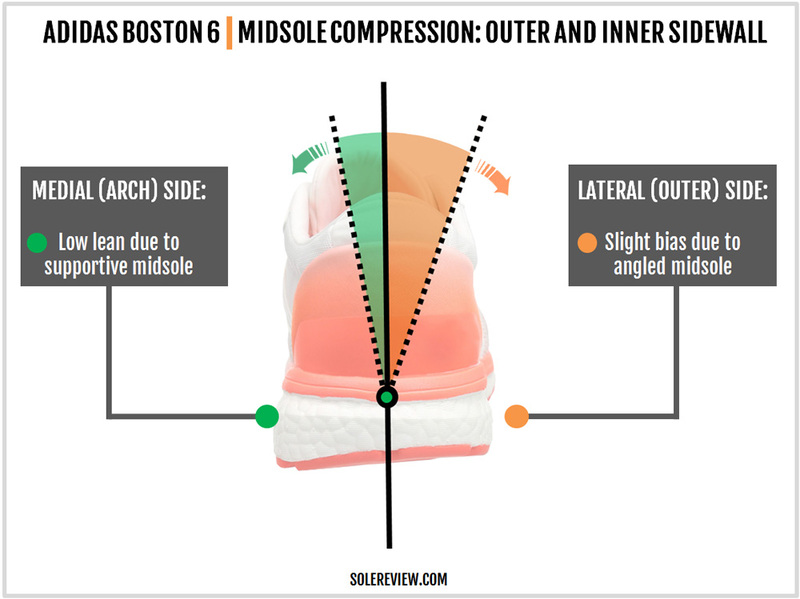 That said, there is a difference between the Boston’s and adios/Glide’s midsole design fundamentals, an area which we’ll delve into during this review. At 244 grams or 8.6 ounces, the Boston Boost is marginally heavier than its non-Boost competitors, and that’s always been the trade-off for the responsive ride quality. 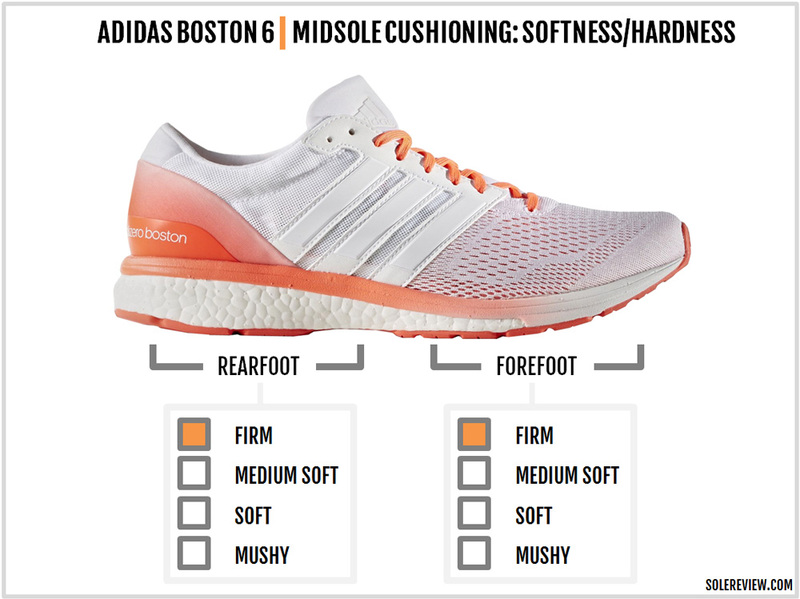 The Boston 5 Boost closely resembled the adios 2 Boost’s aesthetic profile. Elements like the toe-bumper, midfoot stripes, the heel and the mesh type used established a strong design kinship between the two. This year adidas takes a different route, and widens the design separation between the current adios and Boston. While the adios 3 Boost has a distinct retro-racer aesthetic, the new Boston 6 Boost is part Boston 5, part Glide Boost when it comes to the upper design. The spacer mesh and stitched-over toe-bumper combination is replaced by a forefoot upper which is built entirely of engineered mesh (a mesh which has open and close-knit areas). Like many shoes which use engineered mesh, the Boston 6 opts for an internal toe-bumper which gives shape to the toe-box. With this change, the toe-box loses the pointy shape of the Boston 6 and evolves into a wider, rounded profile. Synthetic suede was used liberally on the Boston 5. 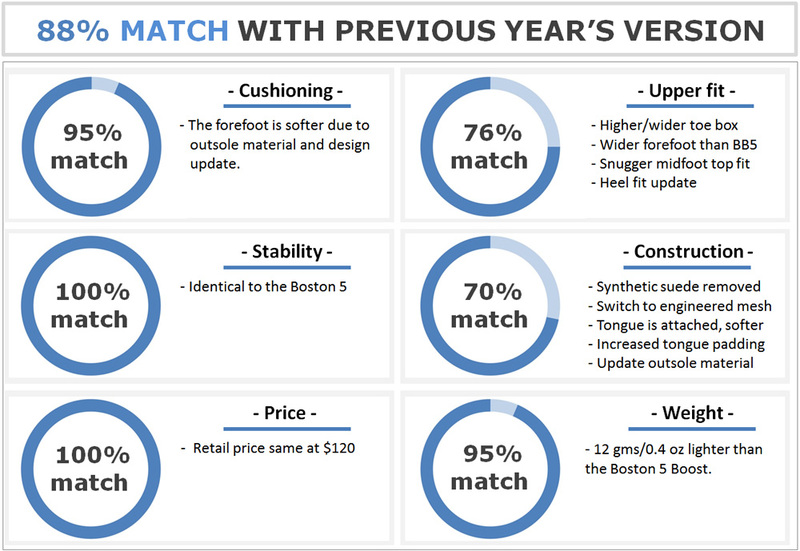 The 2016 Boston switches to a smoother synthetic to construct its midfoot stripes, and the overall usage of synthetic has been cut down in favor of mesh. 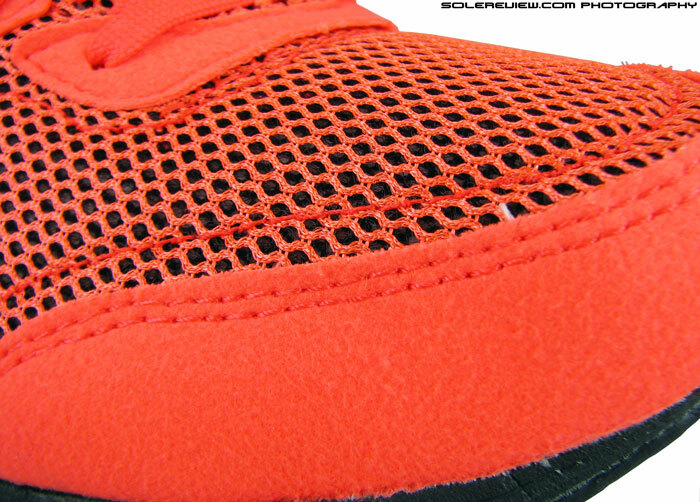 The tongue is now 100% mesh, and even the external heel counter uses mesh with turned-in seams. The Boston 6’s tongue design is very different than the BB5. The new Boston drops the thin, partially unlined tongue and instead incorporates a fully padded tongue with lining. Also, the tongue is semi-attached to the upper in the front (no sleeve, though). 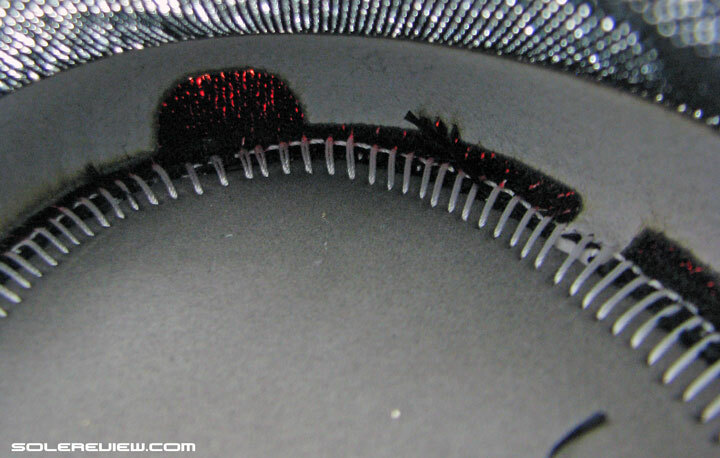 This means that the last year’s lace-loop is no longer a feature on the BB6. The heel collar loses the Achilles dip, and the upper extends higher over the foot. The Achilles part also curves inwards (more) than the Boston 5 to result in a minor fit difference. Rationing the synthetic has a positive impact on weight. 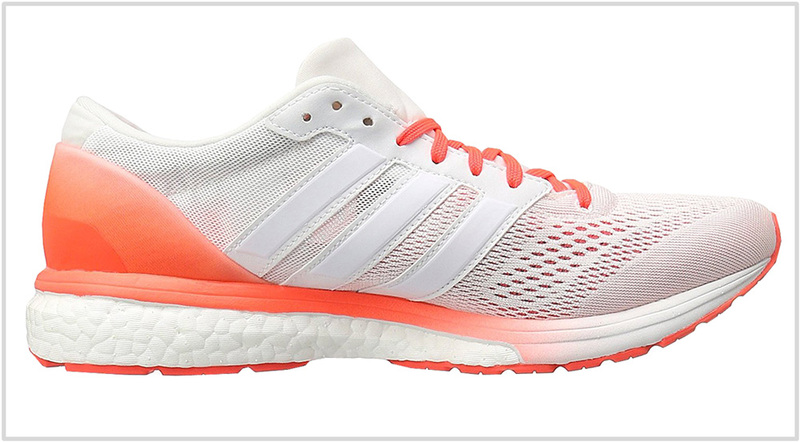 The Boston 6 Boost is 12 grams/0.4 ounces lighter than the Boston 5. Little has changed in the Boston 6’s midsole composition. As before, the 10 mm drop midsole combines a firm EVA foam, fabric lasting, and the responsive Boost compound. 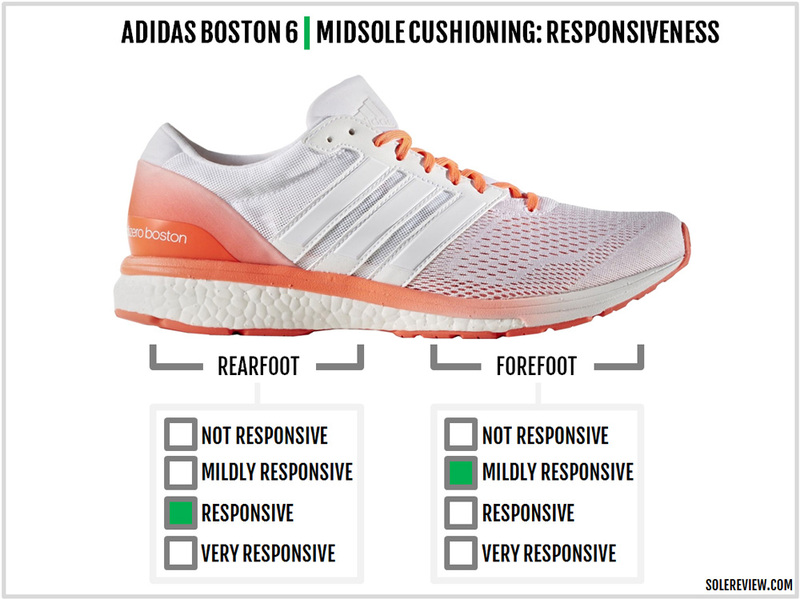 This is adidas’s near-universal design template, except that the Boston 6 Boost has one major difference. On most Boost shoes like the adios, Glide and Energy, the firmer EVA is just a rim around the edges. 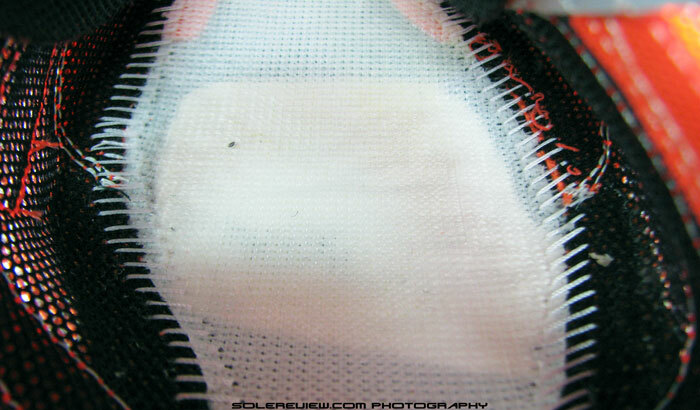 That meant that the foot has direct access to the Boost material after the insole and lasting layer. Not so on the Boston 6. 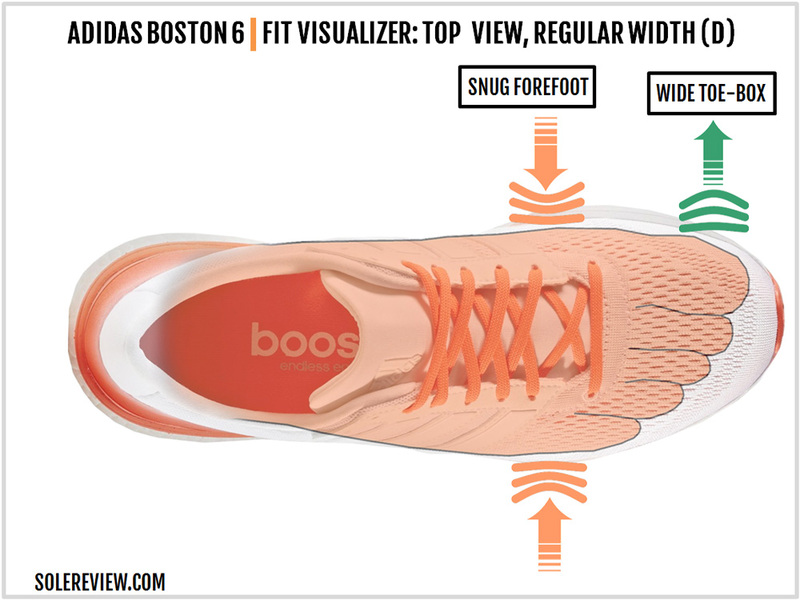 Inside the Boston, the firm EVA happens to be an additional layer over the Boost and not just a rim. 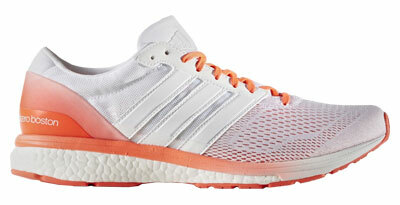 The rear and midfoot Boost is completely layered over with firm EVA foam. Only the forefoot has a window cut out to allow easier access to the Boost midsole. By the way, this is identical to the Boston 5 Boost design. The rubber outsole design is reworked in a few ways. The rubber lugs are slightly larger in size than the BB5, and the section closer to the toe has a higher count of windows exposing the Boost foam. The rest of the outsole is similar to the Boston 5. The midfoot and inner rearfoot is supported with a plastic shank, and there’s generous rubber coverage underneath the heel – around an exposed section of Boost. The Continental rubber used is softer than last year, but only slightly. The adidas Boston 5 was extremely durable due to the hard-wearing Continental rubber. You could get 500-600 miles easy out of the BB5, and there would still be life left in them. adidas has changed the Boston 6’s outsole rubber compound. The material is still Continental branded, but softer than the Boston 5. ‘Softer’ is a relative term, however. If the Boston 5 was ten on a 1-10 scale of hardness, then the new Boston is eight. So the outsole is still very hard, but you can sense that it’s slightly mellow than the BB5. The ballpark figure for the Boston 6 is 450 miles, with wear and tear happening in a gradual manner. The Boston 6’s engineered mesh has a durable feel (unlike the Streak 6’s mesh), so its lifespan should be at par with industry standards. With the toe-box redesign, there’s increased height and width inside. The internal toe-bumper creates more room on the big toe side, and also adds vertical space. Initially, the stiffener is felt as a separate component inside the toe-box, but over time you get used to it. The Lunartempo 2’s internal stiffener is a good analogy. The tongue has been plumped-up, so the midfoot fits snugger on the top than the BB5. The scratchy feeling produced by the BB5’s raw tongue edges isn’t felt anymore because the Boston 6’s tongue edges are now folded. The noticeably softer and thicker tongue also insulates the lacing pressure better. The only drawback is that the padded tongue runs a bit warmer than the BB5’s open-pored tongue. Since the tongue is attached to the upper in the front, there’s a sensation of increased material over the foot – under the first three lacing rows. Of particular interest is the Boston 6’s heel redesign around the Achilles dip area. The Boston 5 had an Achilles dip and a seam joining the two halves of the outer heel. In contrast, the Boston 6’s heel does not have the seam, nor does it have an Achilles dip. 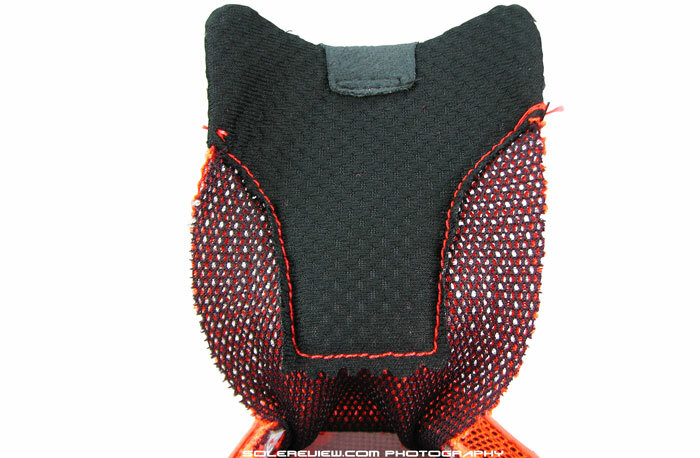 The top of the collar is now rounded, and the outer mesh has no seam. In theory, this update around the Achilles should increase heel grip, but it doesn’t. Removing the seam makes the top of the heel behave like a tight band of material. The heel fit quality isn’t evenly spread like the Boston 5, where the entire heel sat flush over the foot. On the Boston 6, the heel grip is more focused at the top, and one notices a small fitting gap below the edge. The heel doesn’t slip, but you feel like it is. The lack of synthetic overlays on either side of the forefoot changes the upper fit. Perhaps roomier isn’t the right choice of word to describe the change; easygoing is. 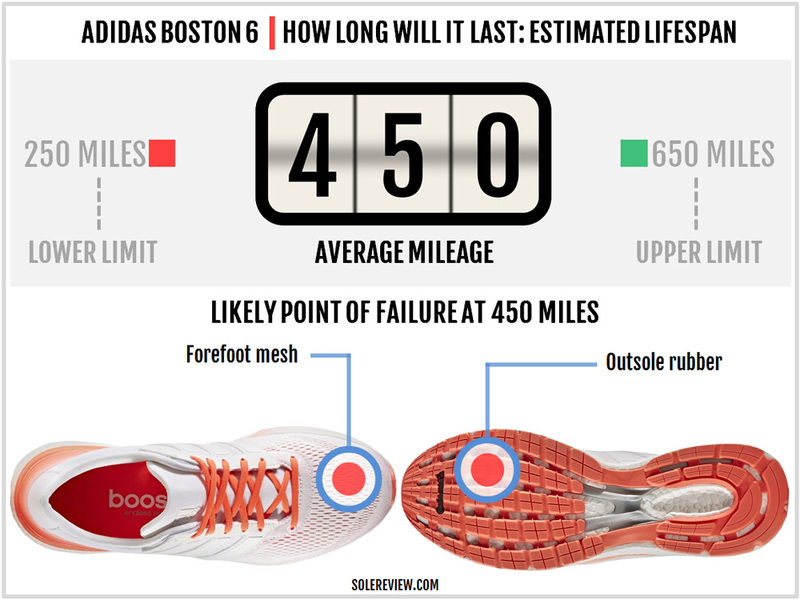 The last doesn’t seem to have changed, only that the mesh-only forefoot is less space restrictive than the Boston 5. In other words, the Boston 6 does not feel as long and narrow as the Boston 5 did. Over the forefoot, the Boston 6 does not have the synthetic suede piece adjacent to the first lacing row. As a result, forefoot flexing is more comfortable than the BB5. The sizing fits true. In some cases, the Boston 6 might initially feel shorter due to the redesigned Achilles heel section. The Boston 6 is undeniably firm. The heel is stacked over with firm EVA, and the forefoot stack isn’t very high. What is of significance, though, is that the Boston 6 is slightly softer than the 5. This is noticeable under the forefoot because of two reasons. The first reason is the outsole change, as the use of slightly softer rubber decreases firmness. When compared to the Boston 5, the forefoot outsole has a higher number of windows with exposed Boost foam. This update contributes to the increased softness as well. The adidas Boston became Boost infused from version 5 onwards, and that created a brand new ride experience. While the material core of the Boston 6 is the very responsive Boost foam, its behavior depends on your running pace. The reason is that the firm EVA is placed over the Boost foam, as opposed to the rim-only design of the Glide and adios The responsiveness of the Boston increases with higher running speeds; at lower running speeds the spring-back quality is less accessible. The heel has a slight compression bias towards the outer side, which is common for most running shoes. Other than this expected behavior, the Boston is very supportive. The midsole firmness and midfoot plastic shank add to the support level. The overall midsole firmness gives the Boston 6 has a smooth and quick transition quality, holding true to its advertised claims of being a fast training shoe. Picking faults with the Boston 6 Boost is hard. The ride is responsive at higher speeds, the shoe is supportive, and the upper fits roomy relative to a shoe of this category. It isn’t the lightest in its class, but not overly heavy either. There’s also an improvement from an upper fit standpoint, as the folded and padded tongue no longer feels raspy. Add to that the well-proportioned fit of the toe-box, and the Boston 6 ends up being a very well polished shoe. The heel fit isn’t perfect, and that ends up being the Boston’s Achilles heel – quite literally so. If you count the smaller things, then you’d bemoan the lack of optional widths and low light visibility. 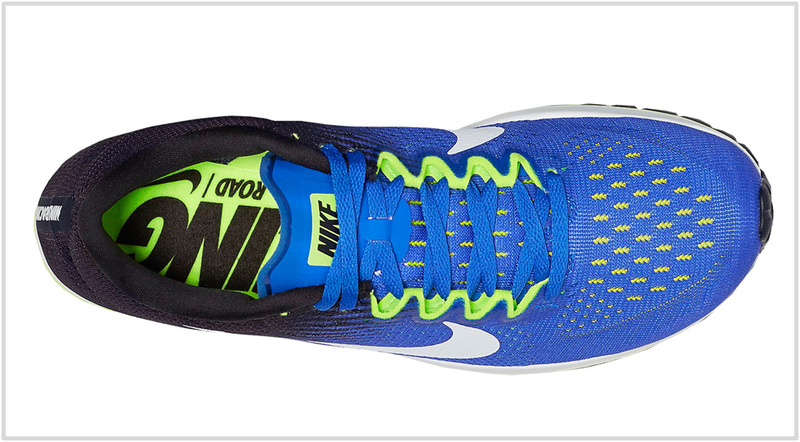 The Glide is the obvious choice for something more cushioned than the Boston. It’s as if the Boston was uniformly loaded with more foam, more upper material and increased interior room without losing the core, responsive ride quality. The Glide will manage those long mileage training runs perfectly well, and it’s by no means a slow shoe. And why not the Energy or the Ultra Boost instead? Well, because if you’re getting a Spartan Boston, then the ultra soft EB or the UB is sheer footwear decadence. Some of you might think that having both the Boston and the adios is gratuitous, but we believe that these shoes complement each other. 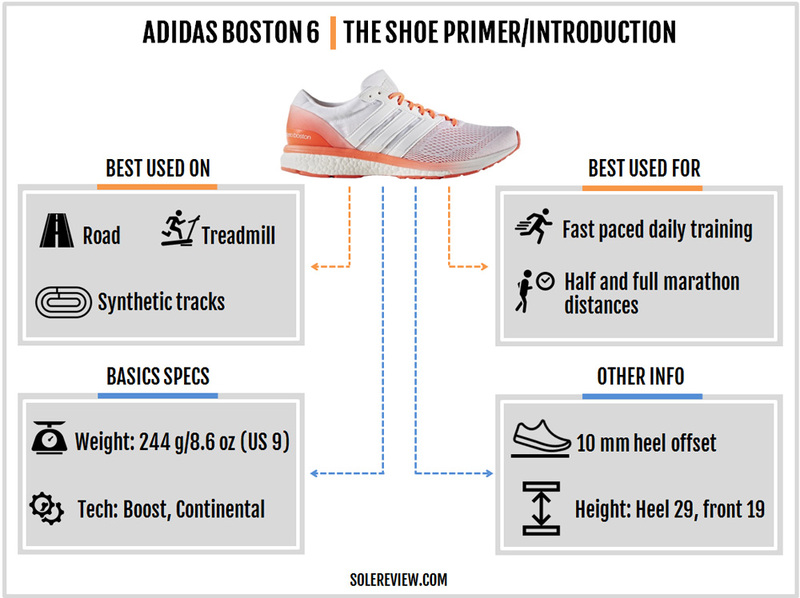 The adios 3 is a shoe which feels noticeably faster than the Boston, and not to mention, lighter. We gave a thought to the Takumi too. But that shoe is a true racing flat, and might be uncomfortable for many who aren’t used to the extreme running shoe flatness. The Nike Pegasus 33 has a cushioned and responsive ride without bogging you down, so that’s a good shoe to do your long distance training in. The 1400 V4 is a fast shoe meant for race days and stands differentiated from the Boston with regards to the ride quality and weight. The toe-box and forefoot area loses the long and narrow fit of the Boston 5 due to the change in design and material. The tongue’s upholstery and fit quality get an upgrade, and the heel fits differently than the BB5. The ride is slightly softer, but other than that, the shoe rides identical to the BB5.